If you think gum disease only happens to the other guy (or gal), think again. If you’re over 30 you have a 50-50 chance for an infection. After 65 the risk climbs to 70 percent. Fortunately, we can effectively treat most cases of gum disease. But depending on its severity, treatment can involve numerous intensive sessions and possible surgery to bring the disease under control. So, why not prevent gum disease before it happens? First, though, let’s look at how gum disease most often begins—with dental plaque, a thin film of bacteria and food particles built up on teeth and gum surfaces. If plaque isn’t consistently removed through daily brushing and flossing, it doesn’t take long—just a few days—for the bacteria to infect the gums. 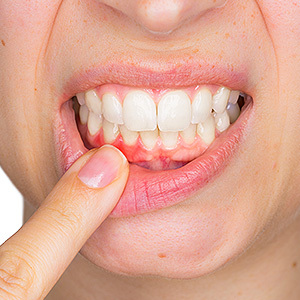 While it’s not always easy to detect gum disease early on, there are signs to look for like red, swollen and tender gums that bleed easily when you brush or floss, and bad breath or taste. The infection is usually more advanced if you notice pus-filled areas around your gums or loose teeth. If you see any of these (especially advanced signs like loose teeth) you should contact us as soon as possible. Obviously, the name of the game with prevention is stopping plaque buildup, mainly through daily brushing and flossing. Technique is the key to effectiveness, especially with brushing: you should gently but thoroughly scrub all tooth surfaces and around the gum line, coupled with flossing between teeth. To find out how well you’re doing, you can rub your tongue along your teeth after you brush and floss—you should feel a smooth, almost squeaky sensation. You can also use plaque-disclosing agents that dye bacterial plaque a particular color so you can easily see surface areas you’ve missed. You can also ask us for a “report card” on how well you’re doing during your next dental visit. Dental visits, of course, are the other essential part of gum disease prevention—at least every six months (or more, if we recommend) for cleaning and checkups. Not only will we be able to remove hard-to-reach plaque and tartar, we’ll also give your gums a thorough assessment. By following this prevention regimen you’ll increase your chances of not becoming a gum disease statistic.